Mac Stevenson is a Utah native and currently resides in North Ogden. 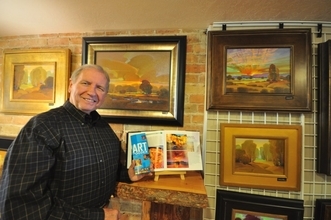 Mac has spent much of his life dedicated to teaching art: teaching at high school and University levels. He now finds pleasure in the freedom to create without 30+ students looking over his shoulder. He is having the time of his life practicing as an artist. Mac's works range from traditional to abstract and he uses a variety of mediums: watercolor, oil, gouche, pastel and mixed media.